On the eve of reportedly rolling out a new peace plan for Israel and the Palestinians, the Trump administration ditched Secretary of State Rex Tillerson and tapped CIA Director Mike Pompeo to replace him. Trump and Tillerson rarely saw eye to eye, and Tillerson ran the State Department under a cloud almost from the start of his tenure in February 2017. He clashed with Trump on the Iran nuclear deal and often appeared to be out of the loop on Middle East policies, or intentionally acting as the "good cop" as opposed to Trump's more aggressive "bad cop" tendencies. Pompeo now faces the challenge of coordinating more closely with the White House to have a consistent policy in the Middle East. Tillerson had the shortest tenure of any Secretary of State since Lawrence Eagleburger in 1992. Yet despite its short length, for the Middle East his tenure was largely wasted as many crises unfolded in Iraq, Turkey, Syria and the Gulf. Tillerson found the region to be his most challenging arena. In Turkey in February, he sought to smooth relations with President Recep Tayyip Erdogan, who wanted the United States to stop supporting the mostly Kurdish Syrian Democratic Forces in eastern Syria. While Tillerson was glossing things over, the Pentagon instead was increasing its role in Syria. A year later, Ankara and Washington have worse relations, in part because Tillerson was not frank about U.S. policy. In contrast, Pompeo has previously characterized Erdogan's Turkey as a "totalitarian Islamist dictatorship" like Iran. Turkey is likely to view Pompeo as a tough negotiator — and that is probably a good thing. Erdogan needs the United States to speak clearly about its role in Syria. Tillerson seemed out of touch when he met Russian Foreign Minister Sergey Lavrov in April 2017. He warned that the era of the rule of the Assad family, a key ally of Russia, was coming to an end. He also claimed Russia risked becoming irrelevant in the Middle East. The opposite was actually happening. Russia was growing closer to Egypt, Turkey and other states and becoming a key player in the region, even working with Israel on Syrian policies. Here again, Pompeo seems likely to have a more realistic approach to Syria and Russia. He has included Russia in a list of foes who "want to undermine Western democracy." He will be viewed as a more serious challenge by U.S. foes because of his CIA background. The administration appeared to cut Tillerson out of dealing with the Israelis, Palestinians and Jordanians on the peace process, often managing relationships directly through the White House and Trump's son-in-law Jared Kushner. Pompeo is considered to have views closer to those of Trump's inner circle. 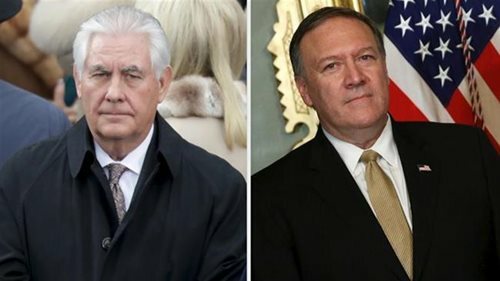 Andrew Miller, a non-resident scholar at the Carnegie Endowment for International Peace, tweeted on March 13 that "leaders in Egypt, Israel, Saudi Arabia and UAE are likely very pleased with the news" of Pompeo's appointment. In December, Pompeo praised efforts by Israel and Saudi Arabia to work together to confront terror. While Tillerson may have accepted that Saudi Arabia is a partner of the U.S., he was deeply frustrated with Saudi Arabia's decision in June 2017 to cut relations with Qatar, and he expressed criticism of the country's approach towards Yemen and Lebanon. The Saudis, and their allies in Egypt, Bahrain and the United Arab Emirates, felt that Trump's May speech to the Arab Islamic American Summit gave them support to clamp down on Qatar, which they have accused of spreading instability in the region. Tillerson headed to the region in July to try to smooth things over but failed to patch things up. During the September and October difficulties in northern Iraq over the Kurdistan Region's decision to hold an independence referendum, Tillerson again played catch-up. The Iraqi army was preparing to push Kurdish forces out of the strategic oil city of Kirkuk. On Oct. 13, Defense Secretary James Mattis said that Tillerson was "the lead" on dealing with the crisis and that the United States sought to "keep any potential conflict off the table." Three days later, Iraqi forces clashed with the Kurds. The Iraq trouble continued and Tillerson visited the region for meetings in Riyadh on Oct. 22. There, in somewhat sloppy wording, he encouraged "Iranian militias that are in Iraq" [i.e. Iranian-backed Shi'a militias] to "go home." The next day, Iraq's Prime Minister Haider al-Abadi summoned Tillerson to Baghdad and told him that the Hashd, a conglomeration that includes many of those Iranian-backed militias, was the "hope of Iraq and the region." Pompeo, however, has warned about Iran's efforts to increase its influence in Iraq and the wider region. Indeed, Iranian general Qassem Soleimani played a key role in pushing the Kurds out of Kirkuk, and Pompeo appears to understand the Iranian threat; his views dovetail with Trump's on this key issue. When he made a major trip to the Middle East in February, Tillerson tried to tone down the administration's aggressive tone. In Cairo, Ankara, Amman, Beirut and Kuwait, he held major meetings. But there was no follow up from the State Department or the administration, partly because the United States lacks ambassadors in many Middle Eastern countries. At the time of his firing, the administration still had not appointed ambassadors to Egypt, Jordan, Qatar, Saudi Arabia, Turkey, Libya, Morocco or Sudan. Without ambassadors, the State Department cannot be effective in many of these countries. The reaction to Tillerson's firing has been generally positive in the region among U.S. allies. Saudi Arabia, Israel, the UAE and Egypt will welcome Pompeo's appointment. Turkey will be a larger challenge, since Pompeo's first foreign trip as CIA director was to Ankara. At the least, Ankara will receive straight answers that correspond to the Pentagon's policy. Qatar is also more hesitant about the change. Marwan Bishara, Al-Jazeera's senior political analyst, praised Tillerson's willingness to have different views than Trump, saying he was more "steady and more sober than the president." Iran appears wary of Pompeo. The regime's Press TV spotlighted an analyst who characterized Pompeo as "very negative ... and dangerous." The era of Tillerson playing "good cop" to the White House's more aggressive stance on Iran is over. Seth J. Frantzman spent three years in Iraq and other countries in the region researching the war on terror and Islamic State. He is the executive director of the Middle East Center for Reporting and Analysis and a writing fellow at Middle East Forum.